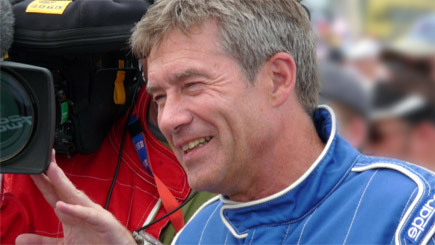 Tiff Needell's TV appearances on Top Gear and Fifth Gear have cemented his status as master of drifts. This is a once in a lifetime opportunity to witness his legendary car control first-hand from the passenger seat of a BMW M4, whilst also taking part in some driving yourself. After three demo laps with an instructor, put the pedal to the metal and drive a Porsche Cayman for three laps of Thruxton's 2.4 mile world-class circuit. This is followed by ten laps driving a Formula Renault single-seater. If this wasn't enough, hold on for two high speed laps in a mini Le Mans Peugeot Cup Car driven by an instructor, before Tiff takes you for three passenger laps in the BMW M4. Relive the day from the comfort of your sofa with a HD DVD of the day. At least one Tuesday, Thursday or Friday date each month between February and November. Dates fill very quickly, so please allow at least six weeks advance booking notice. Minimum height is 5'1'', maximum is 6'5''. Maximum weight is 18 stone. All participants must sign a disclaimer confirming a full British or international manual driving licence and good health. Lasts around three and a half hours, including a briefing, demo laps, over 30 miles of driving time, two laps as a passenger in the Peugeot and three laps with Tiff. All in-car tuition is on a one-to-one basis including the high speed laps with Tiff. Briefings are shared with up to 16 people. Thruxton is one of the fastest circuits in the UK. For safety reasons, revs are limited. Buy extra laps in the Formula Renault on the day, subject to availability. Please call the venue on 01264 882222 if in doubt about the weather.